Many dentists have noticed an apparent increase in the incidence of symptomatic cracked teeth in adult patients. While not every cracked tooth can be saved, many can and our experience with many such cases leads to the retention of teeth that may be initially thought to be hopeless. A recent study by Sung Kang, Bom Kim & Yemi Kim on Cracked Teeth: Distribution, Characteristics, and Survival after Root Canal Treatment, showed a 90% survival rate after two years. This case demonstrates the value of clinical and radiographic evaluation including precise pulp testing and internal microscopic examination of the tooth to determine prognosis and treatment plan. A sixty five year old male patient presented with a chief complaint of pain that began when he bit down on something hard. Clinical and radiographic exam showed that tooth #31 was sensitive to biting and percussion and negative to pulp test. There was a visible crack on the distal proximal surface and there was no probing. 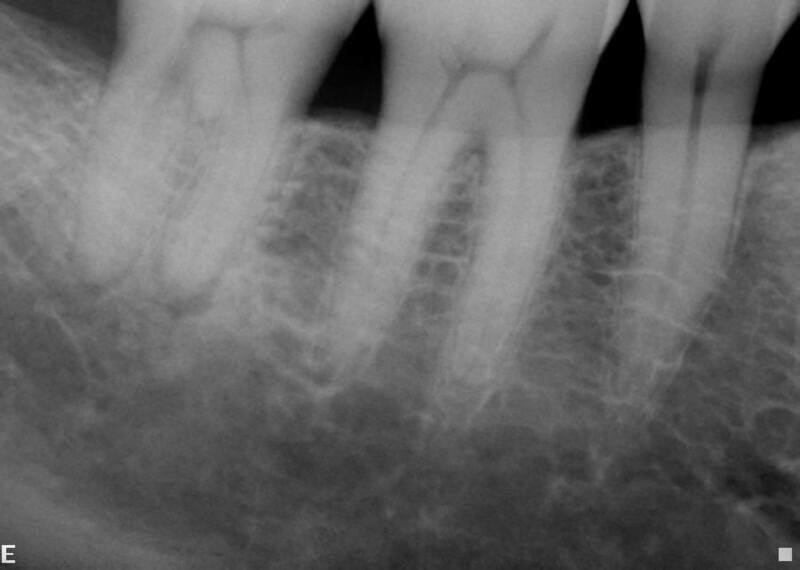 The 2-D radiograph showed a small radiolucency at the apex of the mesial and distal roots. There was no periradicular radiolucency typical of teeth with vertical root fracture. Emergency treatment was performed for pain relief and to provide further diagnostic information. Four canals were located, the pulp tissue was necrotic. Microscopic exam showed a crack was present on the mesial and distal proximal walls of the access cavity. There was no crack extending down any of the canals and no crack on the floor of the pulp chamber. The tooth was closed with a temporary filling and taken out of occlusion. The patient was advised of the existence of the crack and the possible limitations that placed on the long term success of this case. 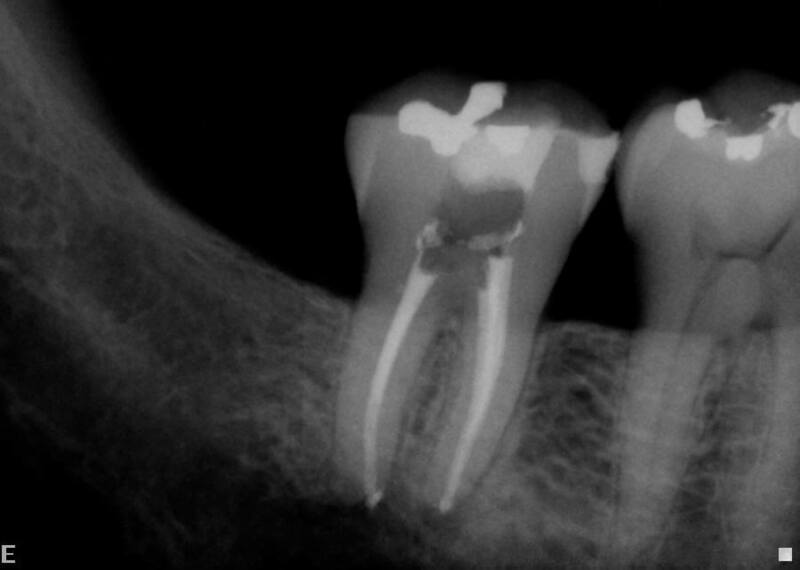 The patient was also informed that he would need to have his dentist place a crown on this tooth soon after the endodontic treatment was completed. 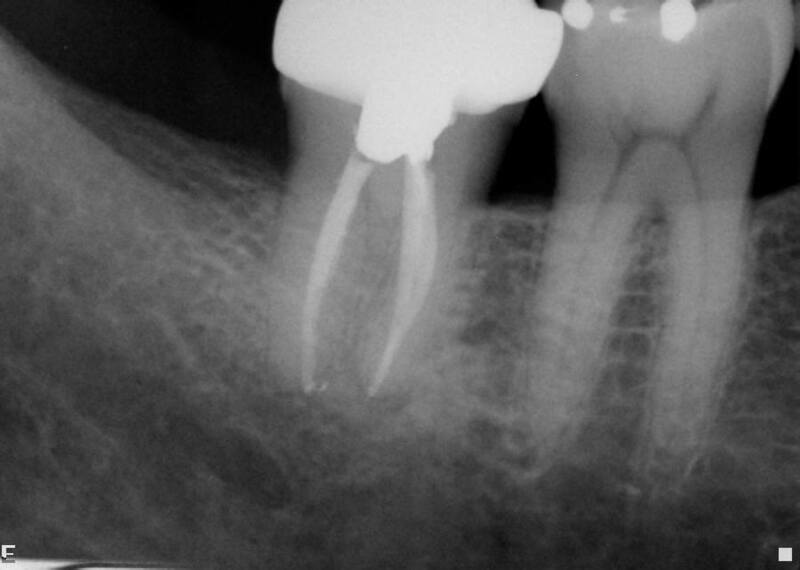 The patient stated that he wanted to try to save this tooth. One week later the patient presented with no pain or swelling. The endodontic treatment was completed. Two weeks later the patient was checked. He had no clinical symptoms and was referred to his dentist for a crown. Thirteen months later the patient presented for recall exam. He reported no symptoms and the tooth was normal to clinical and radiographic exam. He patient stated that he was very happy that he had been able to retain his natural tooth.